Overwhelmed workers are throwing away billions of dollars in unused vacation time. 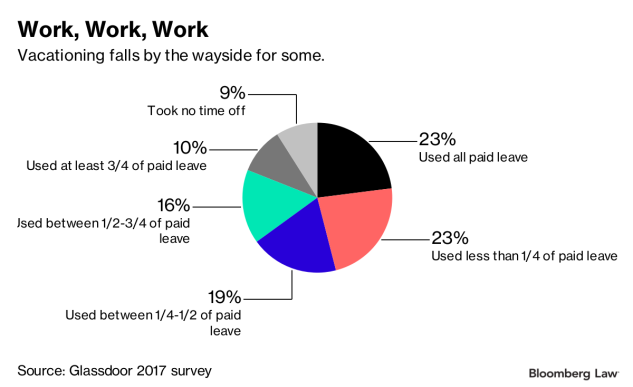 And unlimited leave, the trendy tech sector recruiting tool that’s crept into other industries, has yet to prove it’s the silver bullet to escaping the daily grind. 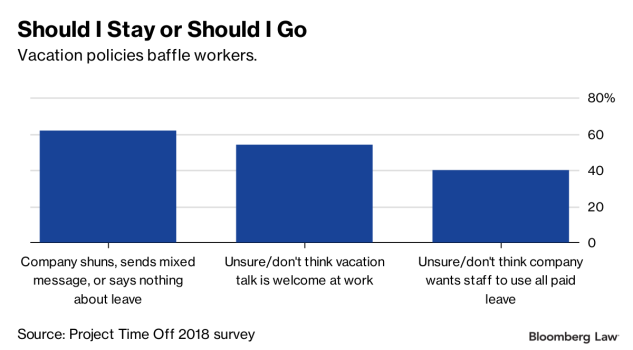 While far from conclusive, related polls suggest that time-crunched employees are forfeiting as many as half of their allotted vacation days each year. The U.S. Travel Association estimates that workers gave up $62 billion in paid leave last year. “That means employees effectively donated an individual average of $561 in work time to their employer in 2017,” the group reported in its third annual survey on vacation habits. Fewer employees on vacation may seem like a win for employers, but having burned out, unhappy staff around saps morale. Kimble Applications co-founder Mark Robinson said having staff work round the clock to fulfill clients’ every whim is great for a company’s billable hours. But he warned that it creates a “false economy” fueled by unused vacation hours and unsustainable productivity levels that collapses once those same workers head for the exits. To counteract employee behavior, some companies have changed over to offering workers unlimited paid leave, though whether that change will move the needle often depends on other workplace factors like company culture, communication, and messaging. Unlimited leave offers employers an advantage in lowering their per-worker accounting costs. They save money on tracking employees’ leave, and they also aren’t required to pay cash for unused vacation time when a worker leaves. The reasons staff say they eschew vacationing range from fear no one else can do their jobs to concerns about lining up adequate pet care. Add in confusion about how/when/if it’s acceptable to take management up on promises of limitless time off, and you’ve got a workforce paralyzed by unrealistic job expectations, rampant connectivity, and good old-fashioned guilt. “People don’t want to feel like they’re letting anybody down,” Robinson says of the natural tendency to overwork oneself. Missed opportunities may be felt even more acutely as Dec. 31 approaches and workers realize they have more leave to take than workdays left in the calendar year. Global consulting firm Kimble Applications found that less than half of the full-time employees it surveyed used every earned vacation day. Kimble’s debut PTO Guilt Report uncovered that a quarter of the respondents had squandered up to four vacation days, while one in five respondents confessed to losing more than a week of paid leave. Career tracker Glassdoor says over 60 percent of workers with paid leave weren’t able to get away for half the vacation time they’d earned. One in 10 reported taking no time off at all. Still, the U.S. Travel Association sees improvement. The 2018 Project: Time Off survey shows that respondents took 17.2 days off last year. That’s up from the 40-year-low of 16 days set in 2014. The survey high remains the 20.3 vacation days employees burned off in 1978, during the Carter administration. For some employers, pairing unlimited leave benefits with the right atmosphere can relieve burnout. The evolving policy—which can include vacation, sick leave, personal days, and other compensated absences—puts employees in charge of deciding how much R&R they need. As long as assignments get done, the theory is workers can come and go as they please. Workforce solutions provider Kronos chose to move to unlimited leave because of blurred lines between home life and work. “This flexibility, we decided, had to go both ways: If we’re asking someone to take an early call with someone in Australia, then we need to be just as comfortable with them leaving early to attend their child’s school event,” Dave Almeda, chief people officer at Kronos, told Bloomberg Law. In the year after the benefit was introduced, Kronos has found that employees take an average of 2.5 more days off under its myTime program than under the prior accrual-based system, Almeda said. General Electric’s policy change in 2015 has yielded mixed results. The change from traditional timekeeping to unlimited leave was an attempt to modernize vacation benefits “for a new and changing workforce,” Kelly Conroy, global communications leader for the company, told Bloomberg Law. The organization rolled the new benefit out in stages, first to executives and then to other salaried employees over the course of 2016. Though the company doesn’t share data on the specific amounts of leave taken by workers, today employees use the program “consistent with how they used the prior vacation plan,” Conroy said. “There needs to be culture and communication around” unlimited leave, LuAnn Heinen, vice president of the National Business Group on Health, told Bloomberg Law. Ambiguity surrounding paid leave nullifies its value, she said. Jay Starkman, CEO of HR shop Engage PEO, didn’t write off unlimited leave entirely. But he said he’s seeing alternatives all around the country. Covering vacation costs: “We’re gonna pay you, but the money must be spent on going away,” he said of incentives custom-tailored to get people out of the office. The one-time payment could be delivered in a lump sum or by refunding travel costs expensed after that fact. But Starkman noted that some employers reserve the right to scrap the vacation subsidy if employees “check in” via email or engage in other telework (even once). Front-loaded vacation time: Given that modern workers may spend as little as 18 months at a company before jumping to the next job, Starkman said giving employees their full allotment of paid vacation on day one rather than having it accrue over days/weeks/years shows trust and fosters competitiveness. Floating holidays: Allowing employees to bank time off for voluntarily working on designated holidays that don’t interest them is gaining favor. “The magic bullet is flexibility,” Starkman said.